I corresponded with a friend from high school who wanted me to put some info on Stamford Talk. Short version: She found a UNC ring, pictured here, in her backyard in Charlottesville, Va. She tracked down the name of the owner- George Richard Fiztgerald- but he was killed in Vietnam in 1966. She found his bio on the UNC website. She'd like to return the ring to his family, whose last known address was in Bridgeport. She hopes this blog can help get the word out. In my friend's words: I have cold called people all over the US. While I was living in Charlottesville I was digging in my garden and found a college ring. I tried then to find info about the person to return it but it was a cold trail. 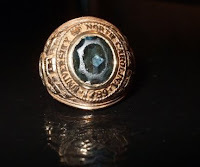 Years later when I moved and found the ring again, I tired again to contact the alumni association to find information on the ring's owner. This time I did get some info. There was only one man who graduated in the year on the ring with the initials in the ring. He is on their website. He was born in Bridgeport to Mr and Mrs James Fitzgerald and had two brothers and two sisters. He was killed in action in 1966 in Vietnam. I have tried the internet, the school he taught at before being deployed, marine websites, cold calling and have not been able to find his family. I know the notification of death was sent to Bridgeport, but they could only confirm the info I had already found at the archives because of privacy acts. I left the ring at my parents' house in Va. the last time I moved, but it is something I think about often. I feel like it is a part of his family and their history. I would really hope that someone in his family might like to have the ring. Please pass this link on if you think you might know anyone with a connection! Oh. that's very cool.. you should ask Diana in Hartford to post on her blog too! Have you tried enlisting help from the area newspapers. Investigations and fact finding should be right up their ally, and I would imagine they have the resources and connections to do it. at the end of the day, they'll get a nice human interest story out of it. Hey anony, good idea. Thank you- I emailed my friend that suggestion! Any word on that ring?? I'm a reporter with the Stamford Times. If it hasn't found its home yet I'd like to help. Please email me the details...Thanks!